East Central Iowa Cooperative was founded in 1996, created by the merger of Jesup Farmers’ Cooperative and Cooperative of Hudson. The newly created company was managed by George Rude from Cooperative of Hudson, with Richard Schaffer from Jesup Farmers Coop serving as the Assistant General Manager. The two cooperatives pretty much mirrored each other in structure with the exception that Hudson had an energy division, as well as grain, agronomy and feed. A little over a year later East Central Iowa merged the La Porte City Cooperative into the fold creating the existing foot print that is ECI today. New facilities have been added over time, with the major new grain facility at Cedar Falls which was necessitated by the Cedar River flood of 2008 that destroyed much of the Cedar Falls grain facility. Our 1,000 members are the company. ECI‘s success is assured only by meeting or exceeding their expectations and your needs. We’re here to deliver value, without compromise. 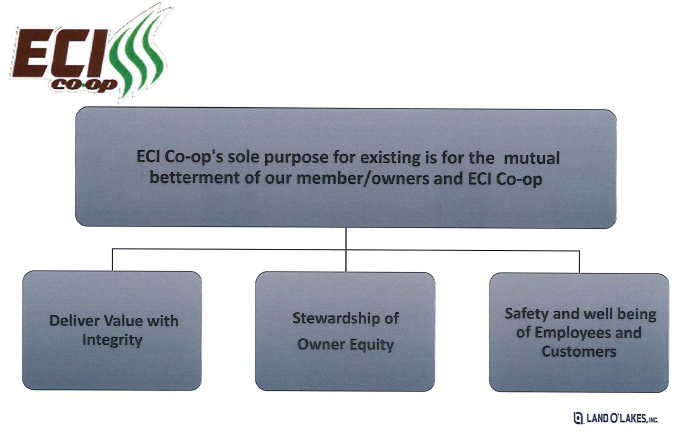 ECI is dedicated to contributing to your success and earning the privilege of being your partner. ECI operates facilities in Cedar Falls, Hudson, Jesup, LaPorte City, and Waterloo providing grain, feed, agronomy, seed, and energy products and services. Our management, staff, and board of directors would be happy to hear from you. CONTACT US for answers to your questions.